A helicopter spreads winter rye seed down over a corn field. When the corn is harvested, the rye will remain, enriching the soil and preventing erosion. Riverside Farms has been our family's home for more than 160 years. Protecting and preserving the soil and water we rely on is integral to everything we do. Our family and our livelihood depend upon it. We are raising our kids here, and we our committed to our community. Our injection and dragline system allows us to apply nutrients below the surface, into thick, grass-covered soil. This photo, taken during a January thaw, shows our fields protected by cover crops, even beneath the snow during the depths of winter. No-till: a technique called "no-till" allows us to plant corn without over-turning the soil, thereby minimizing erosion. 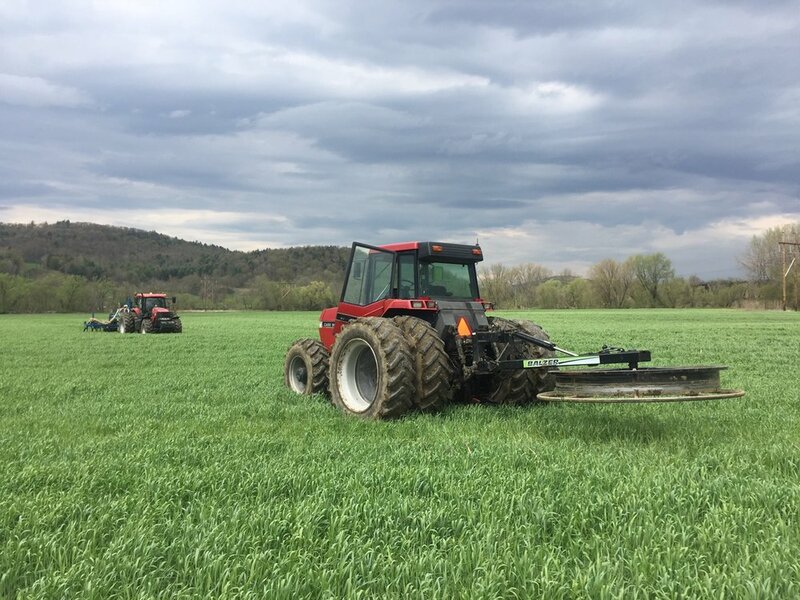 We are proud to be part of the Champlain Valley Farmers' Coalition, a group of farmers working together to implement best practices for livestock and crops to protect Vermont's waterways.